Posted on March 27, 2017 by N.P. Posted on May 4, 2016 by N.P. Join the leading South Asian poet Yuyutsu Sharma and the film director Amitabh Joshi for an evening program dedicated to Nepal. Sharma will read poems from his In Praise of Chomolingma, the Mother of the Winds of the World followed by a screening of Joshi’s film Tashi’s Turbine, an uplifting tale of a small village’s attempt to harness renewable, sustainable energy. Professor David Austell, Columbia University, will introduce Yuyutsu Sharma. A book signing and director Q&A will provide further opportunities for discussion. Yuyutsu Sharma is South Asia’s leading poet published by Nirala with growing international acclaim. He is currently based in New York City as a visiting poet at New York University and has had several readings in Nicaragua, New York, Boston, and the west coast of the United States. Amitabh Joshi, originally from Kathmandu, Nepal, is currently based in New York City. He is interested in exploring environmental sustainability, cultural identities, and youth-related issues. He is a director and cinematographer at Vacant Light, a production company in New York City. Tashi’s Turbine is his first feature-length documentary. The Rubin Museum of Art is dedicated to the collection, display, and preservation of the art and cultures of the Himalayas, India and neighboring regions, with a permanent collection focused particularly on Tibetan art. It is located at 150 West 17th Street between the Avenue of the Americas and Seventh Avenue in the Chelsea neighborhood of Manhattan in New York City. Posted on April 5, 2016 by N.P. Yuyutsu Sharma’s Himalayan Recitals: Yuyu will read from his extensive writings, including his newest published work Quaking Cantos: Nepal Earthquake Poems. at The Yoga Exchange Address: 24 Exchange St, Holliston, MA 01746, Phone:(508) 429-9642 Hosted by Kimberly Cozza Collins and Melanie Harrington. Posted on May 31, 2015 by N.P. Dr. David B. Austell is the Associate Provost and Director of the International Students and Scholars Office at Columbia University in New York City. David was previously the Assistant Vice President and Director of the Office of Global Services at New York University in New York City for seven years, where he was also an Associate Professor of International Education in the NYU Steinhardt School (adjunct). David has both undergraduate and graduate degrees in English Literature from the University of North Carolina at Chapel Hill, where he also completed his Ph.D. in Higher Education, focusing on International Education (his doctoral dissertation, The Birds in the Rich Forest, concerned Chinese students in the United States during the Student Democracy Movement). In 1992, he was a Fulbright grantee in Korea and Japan. David has twenty-five years of executive leadership experience in the field of International Education, and is a frequent speaker and writer on International Education issues. David is also a poet, and his first book of poetry, Little Creek, was published in January 2011 by Nirala Press. His second volume, Garuda (also published by Nirala), was released in March 2012. In 2014, Nirala reissued Little Creek in a revised paperback volume. His fourth book, The Tin Man, is expected from Nirala Press in January 2016. David’s poetry has also appeared in Infusion Magazine and The Red Wheel Barrow. Posted on April 7, 2015 by N.P. Sunday, April 12, 2015 @ 2:00 pm – 4:00 pm at Salem Athenaeum Dangerous Words—Unexpected Destinations: Yuyu Sharma to read at Salem Athenaeum Library with Maria Bennett, Kristine Doll, Shreejana Sharma & Bill Wolak. 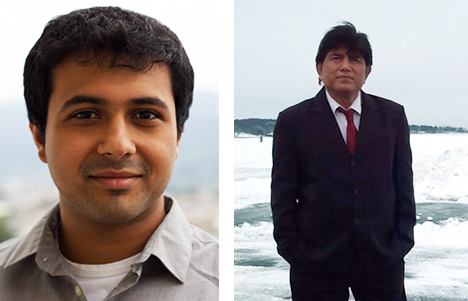 Thursday, April 16, 6:30 pm, Yuyutsu Sharma reading with Sharon Dolin at New York University, Office of Global Studies in collaboration with NYU-SPS, at 7 E, 12 St. fifth Floor. Thursday, April 30,7:30 Christian Wiman and Yuyutsu Ram Dass Sharma: Poetry in the Presence of the Holy, A Poetry Reading and Discussion, at International House, 500 Riverside Drive, Columbia University, New York, 10027, NY Organised by Columbia-ISSO, Columbia Global Poets Series: A poetry reading in collaboration with International House-New York City, and the Columbia School of General Studies.